Pythagoras theorem calculator presented on this web page is a tool which can be used on right angled triangles to find the length of one of the sides when the lengths of the other two sides of a right angled triangle are given. We can know more about this calculator in the following paragraphs. 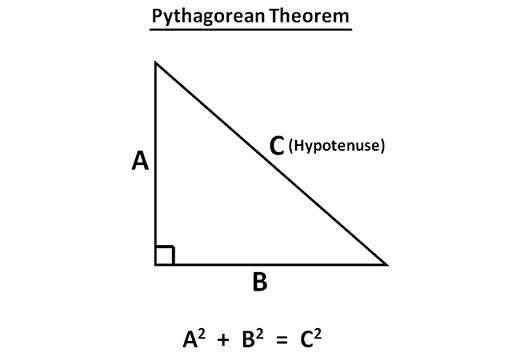 Pythagoras theorem is invented by The famous Greek Mathematician Pythagoras on right angled triangles. In any right angled triangle, one of the three angles must be 90 degree. The side which is opposite to 90 degree or the longest side is called hypotenuse. Pythagoras invented that the square of hypotenuse in a right angled triangle is equal to sum of the squares of other two sides. It would work on any right angled triangle. Pythagoras theorem is a great application in math which is being used not only in the subject math, but also in the field of science.After this one, many inventions have been made on math, due to this theorem. Apart from the regular calculator, people who study math are in need of this Pythagoras theorem calculator. As we said in the above paragraph, the square of hypotenuse is equal to the sum of the squares of other two sides. If we want to check, whether a triangle is right angled triangle or not, we have to apply the above rule. This Pythagoras calculator can be used to check whether a triangle is right angled triangle or not. When students work out lengthy problems on "Trigonometry", in some situations, they may have to find the length of one of the sides of a right angled triangle, when the lengths of other two sides are given. At that time finding the length of one of the sides of a right angled triangle would be an additional burden for them in solving lengthy trigonometry problems. To reduce the burden of those people, we have provided this Pythagoras theorem calculator. When people do preparation of solving word problems on Trigonometry, they may have to spend time to get idea on "How to solve". In some situations, they may have to find the length of one of the sides of a right angled triangle, when the lengths of other two sides are given. In this situation, they would not like to spend time to find the length of one of the sides of the right angled triangle. Because, when people do word problems on Trigonometry, they have to do this work separately and they might do some careless mistakes in doing the above mentioned work. It will definitely disturb the solving of word problems on Trigonometry. And also they would not be able to use the regular calculators to find the length of one of the sides of a right angled triangle when the lengths of the other two sides are given. By using this online calculator, students will find much time to get idea of solving the word problems. School students have the topic "Trigonometry" in both school level and college level math. They may have to do lots of problems on "Right angled triangle". In most of the problems on right angled triangle, they may have to find the length of one of the sides of a right angled triangle, when the lengths of other two sides are given. Students would find answers for these questions as directed in the question. But they would not be sure, whether the answer they have received is correct or incorrect. At that time, they can use our Pythagoras theorem calculator to verify their answers.